What’s been missing for our documentation for some time is decent diagrams showing the normal procedures flows. 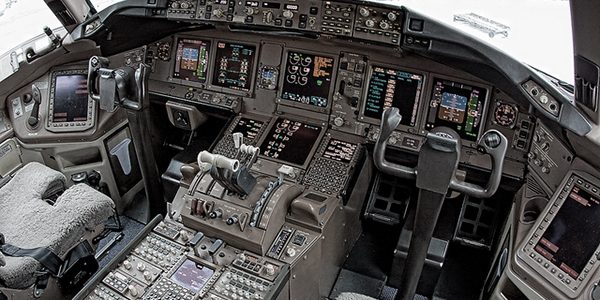 The B777 normal operation centers around these flows, and the normal procedure ECL checklists that follow. For normal operations, the ECL Checklist is a “done” list, where all the items you run through on the checklist should be done before you open the checklist. By far the most common error we see in the simulator in regard to the flows is forgetting to select the CHKL button at the appropriate time to display the next ECL normal checklist, closely followed by inappropriately displaying the checklist early. The Before Start Flow is triggered once the CM2 has obtained start/push clearance from ATC. During the flow the CM2 will action an EICAS recall “Recall… Engine Shutdown“. CM1 responds “Cancel EICAS” to the message(s) read by CM2 this action triggers the associated CM1 Before Start Flow (Trims). At the end of the flow the CM1 calls for the “Before Start Checklist“. Once this is “Before Start Checklist Complete” the CM1 returns to the Ground Engineer and pushback/engine start commences. The Before Start Checklist is called for by the CM1 once the trims have been set in the CM1 Before Start Flow. This assumes the associated CM2 flow is complete and the Before Start Checklist has been displayed by the CM2. Flight deck door is verified by a visual check of the door and door arming mechanism by the CM2 as well as the center console door locking mechanism indications. Passenger signs are read as positioned “AUTO, ON” (NO ELECTRONICS / SEAT BELT selector positions). MCP V2, HDG/TRK and ALT should be called as selected, and verified appropriate. This includes the V1 (PFD vs CDU), V2 as displayed on the PFD (not just the MCP/CDU), an appropriate heading/track selection for the departure, and an Altitude selection appropriate for the (expected/cleared) departure clearance. T/O speeds are called as displayed on the CDU, but the V1 and the V2 should be verified on the PFD. CDU pre-flight confirms the completion of the CDU Pre-Flight Procedure as well as the Final FMC Performance Entry procedure. CDU-L should be set to the TKOFF REF page and CDU-R should be set to RTE Page 2 in preparation for the Departure Review. Fuel is read from the EICAS totalizer indication and no cross check against required fuel for departure (OFP) is scripted, although a mental check of this is a reasonable action. Trim commences with the Stabiliser setting as required from CDU-L and indicated on the Stabilizer Position Indicator. Note that prior to the completion of aircraft loading the stabilizer green band segments may not indicate correctly. The after start sequence is initiated after the second engine start. The associated CM2 After Start Flow commences automatically once the second engine EGT Start Limit has been removed. The Before Taxi Checklist is called for by CM1 after pushback/engine start is complete, the engineer is disconnected and the flaps/flight control check is complete. The CM2 After Start Flow completes with the display of the Before Taxi Checklist. Anti-ice is called based on switch position as selected in the CM2 After Start Flow. Normally the challenge response would be “AUTO” but in icing conditions with the EAI selected on, the correct response would be “AUTO” (wing anti-ice), “ON” (left engine anti-ice), “ON” (right engine anti-ice). The EICAS Recall completed during the After Start Flow indicates aircraft serviceability status for flight. Ground equipment reflects the removal of pushback tug and personnel removed after pushback is complete. This check does not obviate the requirement to report Clear Left / Clear Right prior to aircraft taxi. Once clear of congested areas and when workload is low, the PF will call for a Departure Review. This review of EFIS and other settings for the departure is conducted by the PM, and monitored by the PF during taxi. It completes with the display of the Before Takeoff Checklist (CHKL). WXR/TERR is only activated once CABIN READY has been received. The Before Takeoff Checklist is displayed by the PM as part of the Departure Review flow. PF calls for the checklist once the Departure Review is complete and Cabin Ready has been received. The Before Takeoff Checklist can be done any time and does not need to be delayed until approaching the runway. Takeoff Flaps setting is closed loop and defined by the entry on the CDU TAKEOFF REF page. Cabin Ready displays on EICAS with a chime but is removed automatically after one minute. Once Cabin Ready is received and the Departure Review complete, PF/PM will select WXR/TERR as appropriate. This is typically PF/WXR & PM/TERR however there is non restriction in both crew being WXR or TERR as appropriate for the specific threats of the departure. The After Takeoff Flow is commenced once the flaps are selected UP. The PM should ensure that the flight stage is appropriate – low workload, low distraction environment. The flow and the subsequent After Takeoff Checklist can wait until immediate terrain and weather clearance is assured, ATC is quiet, traffic is light and the immediate demands of the SID (tracking, speed, altitude) are met. The APU … OFF is only usually required after a Packs on APU takeoff. The After Takeoff Checklist is displayed by the PM once the Flaps are selected Up as part of the After Takeoff flow. PF calls for the checklist once the workload is low and the aircraft clear of terrain on departure. PF can use the removal of the Pitch Limit Indicators (PLI) from the PFD as a tip to call for the After Takeoff checklist – although at high weights at UP speed the PLIs may not be removed straight after flap retraction is complete because of proximity to the manoeuvre margin. Descent preparation is typically conduct by the PF who may hand over control to complete the setup. As a guide, preparation consists of some or all of the following actions/considerations, in any order determined to be suitable. Recall EICAS and Operational Notes. Obtain ATIS and if appropriate, updated TAF for Destination and Alternate. Review weather and NOTAMS for arrival and diversion. Select most likely FMC Runway/Approach, STAR and Transition. Review Jeppesen Airport 10-7 Charts for specific station notes. Estimate Landing Weight and enter Flap Setting and VREF Speed. Consider likely groundspeed and Descent Rate on final. Review and compare Jeppesen with FMC, cross-check LEGS page Tracks, Distances, Altitude and Speed Restrictions. Verify Approach, Missed Approach and Holding. For NPAs, validate FMC approach for LNAV and VNAV use. Verify Missed Approach Path against Chart. Consider the impact of auto-LNAV engagement if differences exist. Consider settings in NAV RAD, FIX, VNAV DES, DES FORECAST, OFFPATH DES, Approach RNP required, ALTN list. Assess likely arrival fuel and compare with Minimum Diversion Fuel required. Review Landing Distance Required and compare against Landing Distance Available. Consider likely taxiway exit and select an appropriate Autobrake setting. Review Taxi Route after landing in view of NOTAMS and likely parking stand. The Descent Checklist is typically completed once the Arrival Briefing is completed. Like all normal checklists, the Descent Checklist is intended to be completed against actions that have been already completed. Recall verifies the aircraft status for the approach and landing and should be completed prior to the preparation for descent and approach. Similarly, Notes may contain restrictions or requirements that may well affect the choice of airport, runway or approach. Autobrake is chosen after a Landing Performance Assessment. The Landing Checklist is displayed by the PM after selecting Flap 20 (irrespective of the landing flap setting). When calling for the Landing Flap setting, PF will add a call to complete the Landing Checklist “Flap 30… Landing Checklist“. These two SOP requirements are important barriers to forgetting to run the Landing Checklist. The After Landing Flow is actioned once the aircraft has reached Taxi speed, cleared all active runways, and the crew have received, briefed and understood the subsequent Taxi Clearance from ATC. The flow is actioned by the CM1 stowing the Speedbrake Lever – CM1 should not take this action until the aforementioned have been done. Should the aircraft be required to hold between two active runways, the speedbrake lever can be stowed and the flow completed while waiting. The flow completes (as they all do) with the EFIS CHKL switch to display the After Landing Checklist on the ECL. The After Landing Checklist is displayed as the last item in the After Landing flow. The trigger to commence the flow is CM1 stowing the Speedbrake Lever after landing – irrespective of which pilot is PF. The Speedbrake lever is stowed after landing by CM1 and commences the PM After Landing flow. CM1 should not stow the Speedbrake Lever until all active runways are cleared, taxi clearance is received and the taxi brief confirmed/updated. If the aircraft is required to stop/wait between active runways, the Speedbrake Lever can be stowed and the After Landing flow commenced. Strobe lights are left/turned ON while crossing any active runway after landing. Clearing the runway, the PF may call for the PM to select the ground maneouvre camera (CAM) onto the PM ND. Ideally the PF/PM should turn off the WXR on that side prior to displaying the CAM, since WXR cannot be deselected on that side once the CAM is displayed on the ND. Crew should be aware that extensive taxi after landing with the Flaps fully extended can be taken as a sign by ATC, particularly if communications with ATC has not been established. If TERR mode was in use on landing, this is deselected as part of the After Landing flow by the onside pilot. While this flow commences with the APU, starting the APU is typically delayed until approaching stand. At approximately 2 minutes prior to parking on stand the APU is started and the After Landing Checklist called for and completed. Occaisionally the taxi to stand after landing is extremely short. In this instance the crew should consider starting a clock once reverse thrust is deselected to provide a time for the minum engine cool down after landing (3 minutes). Starting the APU by recall late in the landing roll is usually a better choice rather than commencing the After Landing flow before receiving/briefing the taxi clearance. The CM2 Shutdown Flow commences once the N1s have reduce to 10% and CM1 switches the SEATBELT Signs OFF. The Shutdown Checklist is displayed as the last item in the Shutdown flow. The Parking brake is an item where the required state is not scripted and the CM1 calls whether the Parking brake is Set or Released. That said, best practice is typically to delay commencement of this checklist until the the ground engineer has confirmed that chocks are in place and the Parking brake is released. Crew should be aware that leaving the aircraft with the Parking brake set and chocks not in place leaves the aircraft liable to roll on inclines once residual hydraulic press as bled away. The Secure Flow is actioned once all passengers have left the aircraft. However if you’re handing over to the next crew these actions may not be required. The Secure Checklist is commenced once all passengers have left the aircraft, and is to be completed anytime a handover to the next operating crew is not possible. We have no policy on the retention of the ADIRU state after shutdown since we currently dont operate any turn around flights. Other airliens typically leave the ADIRU on for times on ground of two hours or less, although cycling the ADIRU off for 30 seconds to force a realignment is standard practice. Packs are typically turned OFF for most of our operations as part of the Secure Checklist. This includes warm/humid countries where leaving the Packs on can causing icing issues after longer peroids on ground. Nice article but still B777-300 Er has the best safety record in aviation world.At the helm of this carbon emissions in the atmosphere.. It’s prudent we’ve got engines burning less sulphur fumes,covering large distances without stoppages.